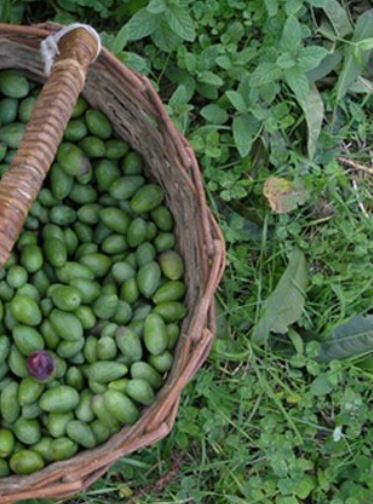 Crete Olive Oil - the foundation of our healthy cuisine and longevity, find out where you can taste local produce in Kriti, explore active farms and ancient trees, find organic growers, millers and bottlers on the island. Crete Olive Oil - in the Chania region find farm at Terra Creta in Kolymvari just 27 km from Chania town. 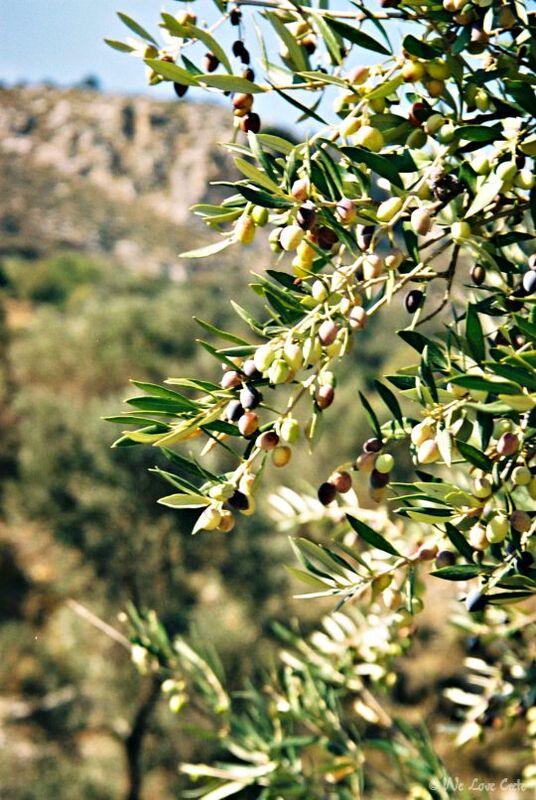 Take a one hour tour which will show the complete path of the olive from tree to table, at this picturesque farm with views to the sea and the White Mountains, which is a very large, professional and multi-award-winning olive oil factory. Also in Chania are some of the oldest olive trees in the world, indeed so old that they have been declared a 'natural monument' or 'Monumental Olive'. The trees are just outside of the village of Ano Vouves, just 5 km inland from this estate. 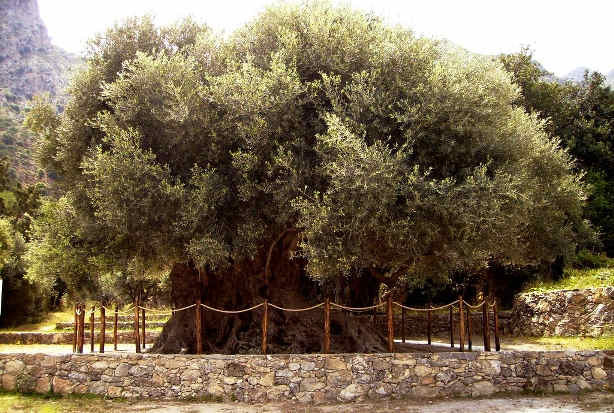 Visit the Olive Tree Museum which protects the ancient olive tree of Vouves, said to be the oldest olive tree in the world. The museum holds the history of the olive culture in Crete, with many different exhibitions. including olive farming equipment, olive storage jars and wood-working tools. 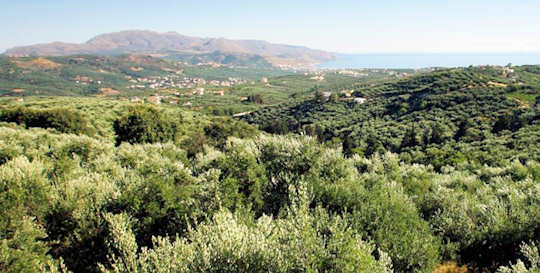 Crete Olive Oil - in the Rethymnon region find three generations farming olives at Melidoni just 31 km from Rethymnon town. 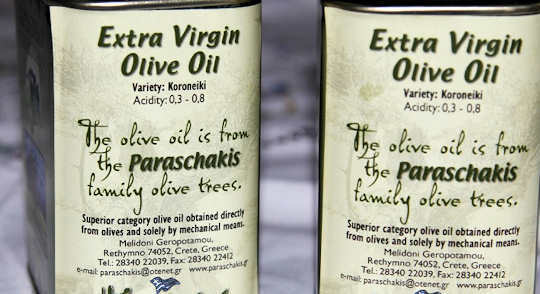 At Paraschakis Olive Oil Farm you will meet the Parachakis family and see a locally owned and run family operation, in the traditional village of Melidoni. Combine this visit with a comfortable drive around the countryside to see Margarites Village and the beautiful and historic Arkadi Monastery, these are both close to the Amari Valley where you could stop for lunch at one of the small village tavernas and still enjoy your leisurely drive back to Rethymnon. 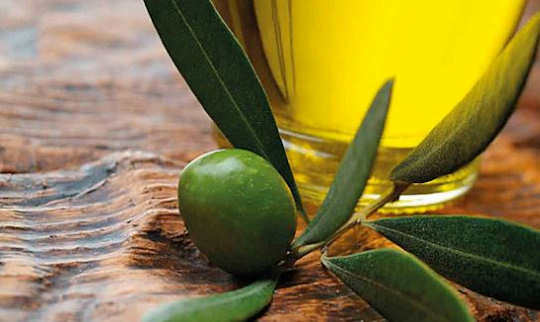 Crete Olive Oil - in the Heraklion region join an 8 Day Olive Harvest and History Tour with accommodation in two different villages, experience two olive groves with a variety of olive types in the company or a specialist agriculturist and the farmers. Assist in the harvest and enjoy picnic lunches in the groves. 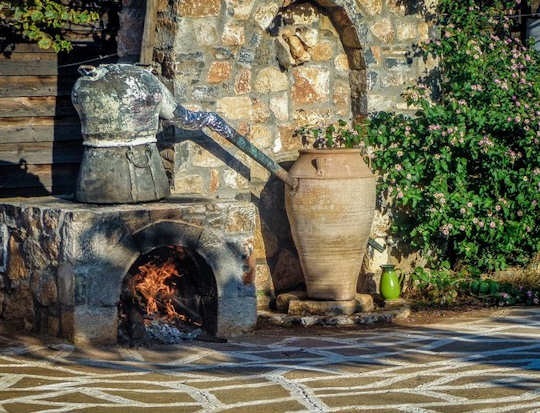 Visit local archaeological sites, enjoy organic local meals, pick nutritious wild greens with a villager, see the olive milling process and see the making of raki at a rakokazano or still. Crete Olive Oil - at Koronekes Olive Farm you can visit one of the largest olive farms in the region of Heraklion and attend tastings on the farm. Here the Koutoulakis family has created a beautiful family estate, perfect for visiting and learning all about the local olive farming, harvesting, processing and bottling, and of course, tasting! The farm is located close to Spilia village, half way between Knossos Palace Aracheological Site and Archanes Village, in an area rich with wineries and local tavernas, within easy driving distance of Heraklion Town of only 11 km. Bookings are required for tours and tastings. The Olive Tree of Azorias - this ancient olive tree is near the village of Kavoussi and the ancient site of Azorias in eastern Crete. This 3500-year-old tree is preserved as a natural monument. Leaves from its branches were used in ceremonies of the Greek Olympic Games in 2004. The diameter of the tree is nearly 5 m.
Make sure you give plenty of notice if you intend to visit for a pottery or cooking lesson, contact prior to visiting. See the donkey and chickens, sample home-grown vegetables and local honey. See the making of raki or tsikoudia, a strong clear spirit made from grapes. Photographer Manolis Tsantakis celebrates the ancient olive trees of crete with his work shown in this intriguing video, with music by Mikis Theodorakis. Consider the characteristics of the flavours: pepperiness, pungency, fruitiness, bitterness, or blandness. Can you taste herbaceousnnes, or is it buttery, floral, almond, apple, grass, or citrus? In addition, taste the same olive oil with food. If you are at home you might like to try this with any of the following; warm boiled potatoes, fresh mozzarella, ripe tomatoes, slightly toasted warm bread, salad greens or cooked vegetables. "mmm, it tastes green with a herby nose of green grass, rocket, green tomatoes and mown hay" Just kidding!